Blessed be the ties that bind: our Christmas dilemma and how we solved it! Signs of the Times, December 2005. Before marriage my family used a Family Christmas Cheer Formula (FCCF) where one side (Family A) would celebrate on Christmas Day, while the other side (Family B) would grit their teeth and use Christmas Eve or Boxing Day. The following year Families A and B swap as to who gets to grit their teeth and who celebrates on the revered celebration day. How much wood would a woodcuck chuck if a woodchuck could chuck wood? Actually, a woodchuck would chuck no wood since a woodchuck can’t chuck wood. 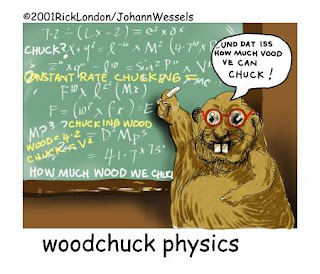 But if a woodchuck could chuck and would chuck some amount of wood, how much wood would a woodchuck chuck? Well, even if a woodchuck could chuck wood and even if a woodchuck would chuck wood, should a woodchuck chuck wood?—That’s the question we should really ask ourselves. The reality is, a woodchuck should chuck wood as long as a woodchuck could chuck wood and as long as a woodchuck would chuck wood. To answer the initial question, however, we must first have a closer look at what it is really asking. The dictionary has several meanings of the word chuck. Tap, throw and vomit are just a few of its definitions. Also, a “woodchuck,” as discovered in my research, is actually a groundhog, weasel or whistle pig. Finally, we should also be sure of the definition of “wood.” This can mean either the hard, fibrous substance beneath the bark of a tree, a golf club or a keg. And so by substituting these terms into the question I’ve come up with three possibilities of what the question is actually intending to ask, answering each. Question 1: How much hard, fibrous substance beneath the bark of a tree would a ground hog tap if a ground hog would tap the hard, fibrous substance beneath the bark of a tree? Answer: Enough to produce a handful of sawdust. Question 2: How much of a keg would a weasel throw if a weasel would throw a keg? Answer: Enough to hold a handful of sawdust. Question 3: How much of a golf driver would a whistle pig vomit if a whistle pig would vomit a golf driver? Answer: Enough to require a handful of sawdust. While we can speculate until the woodchuck chucks, which definitions the question intends, the only thing we know for sure is that if you see a woodchuck about to chuck wood, you’d better either be wearing safety goggles and an apron or stand well back. "Like cubbyhouses as a kid? Imagine what kind of cubbies could be in heaven!" had, a cubbyhouse? I’ve always wanted a treehouse but only ever had one on the ground. How many Weet-Bix does it take to change a lightbulb? This requires some explanation but is a valid question that many are quick to dismiss as a joke. First, did you know that if all the Weet-Bix eaten in Australia in 2004 were laid end-to-end it would be a very expensive exercise and a logistical nightmare to construct (not to mention the minor side effect of THE ENTIRE OCEAN BEING SOAKED UP!). Sanitarium claims this cereal of ‘Bix would stretch almost three times around the equator. When asked for hard evidence, they admitted they hadn’t actually tried it but in theory it worked out. Well, we all know evolution is also a theory and it’s when we combine these two theories we find our answer. Using evolution’s theory, we discover that by the time our friendly “soy-milk soakers” were laid out around the world three times the final, humble Weet-Bic (the singular of the plural, Weet-Bix) in the line would have evolved into a light bulb. 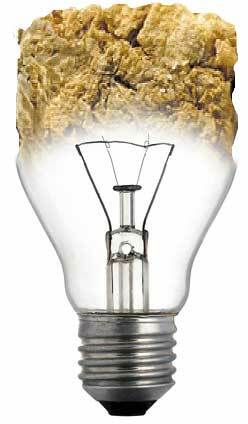 Therefore, in answer to the initial question, it takes an entire year’s worth of Weet-Bix to create a light bulb that can be used to replace the original (BTW: this will have to take place over billions of years). The first instance of a light bulb being changed is recorded in the first chapter of Genesis. “Let there be light,” God said, and there it appeared. 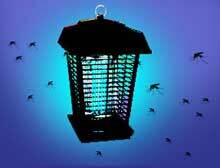 Since then, humans have been searching to find a way to change light bulbs with the same ease as God did. We’ve experimented widely over the years and the results of Irish, blondes or accountants changing light bulbs all seem to lack the relaxed nature God’s method involved. Some of the most disastrous attempts at changing light bulbs have involved marshmallows, asthma pumps and V8 pogo sticks. However, the most catastrophic attempt happened only recently (you may have seen it in the news), which involved a tractor, two goldfish, a hair dryer and disco ball. Since the accident, all further experimentation has been postponed indefinitely. While Huey was able to swim again with the aid of a “swimming frame,” Duey had to be flushed down the looy. Friendly advice: While fish may appear to like eating Weet-Bix, don’t put too many to your fishbowl at once (and never add So Good). Signs of the Times cover article, September 2005. 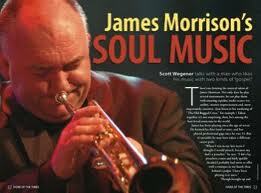 There’s no denying the musical talent of James Morrison. Not only does he play several instruments, he can play them with amazing rapidity, multi-octave versatility, creative improvisation and, most importantly, emotion. (Just listen to his rendering of “The Old Rugged Cross,” for example.) Taken together, it’s not surprising, then, he’s among the best-loved musicians in the world. Where does belly button lint come from? Your lint gland works similarly to a fairy-floss machine, and can be heard at work if you place you ear on your stomach. The yearly production of lint ranges from as little as .074 grams and, in some rare instances, up to a whopping 2.8 tonnes of lint. It all depends on how charismatic a person’s gland is. So why do we have bellybutton lint? Well, it has numerous applications. Evolutionists have always claimed, and still do, that the lint is all that now remains from our evolutionary time as a guinea pig. Some countries have known for centuries the high nutritional value of bellybutton lint. With its high concentrate of folate and chicken-like taste, they serve it as an exotic delicacy to those who can afford it (apparently it tastes great with soya sauce and honey). In some of the colder-climate countries, people make garments out of lint, which is proven to be up to 40 per cent warmer than sheep’s wool. Other civilisations have been known to use lint for housing, communication, recreation and transport. 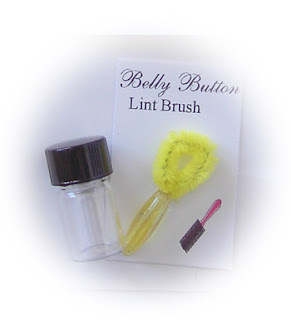 So it seems that bellybutton lint really is nature’s own Swiss army knife. Reader's Question: Why is the lint blue? A. A healthy human produces a dark blue lint. The less healthy the lighter in colour it gets. I believe the dark blue colour in the lint is from the gases that react in the “fluffis outis” gland . This is for the same reason the gasses in the air make the sky look blue also. INTERESTING FACT: The fear of being consumed by bellybutton lint is called bellyfluffobia. These people are colloquially refered to as “navel gazers” and constantly stare at their bellybutton to make sure none develops. As they say, “A watched button never fluffs”. "But . . . having all this knowledge, we still slip up in full view of our Judge." Lucky RECORD: Match ’n’ win! I wrote most of this as a place holder for an appeal article for people to give generously to an offering to help fun the magazine, called RECORD. Most of it was left in! From 2005-2007 Scott Wegener contributed weekly to the Seventh-day Adventist church's South Pacific Division's weekly RECORD news magazine. Mainly working on the "Flashpoint" section, made up of snappy news stories a mere couple of paragraphs long, Scott collated and edited Christian related news stories that were usually either inspiring or through provoking (or perhaps downright ridiculous). There's perhaps little point to republishing the hundreds of articles he completed again on site, but instead, here's perhaps his all time favourite he pieced together. There’s been a return to old-fashioned values in sport, it seems. And despite contrary economic pressure, it appears it is catching, suggests Signs online editor Scott Wegener. Signs of the Times cover article, January/February 2005. The Australian cricket team’s wicket-keeper/ batsman, Adam Gilchrist, is among the most exciting players in cricket today. He scores just as many runs as the best of batsmen, but usually at such an explosive rate that bowlers might wish they’d never walked onto the field. Recently, however, Adam Gilchrist has not only become an ambassador for a major aid organisation, but also decided to exchange one of cricket’s long-accepted practices for honesty. "R2-D2 crates a midiclorean simulation program allowing flawless use of 'The Force'. Stolen by the dark side, they use R2 for ultimate evil that can only be stopped by he who knows him best, C3-P0." Ordinary People, Extraordinary God, 2005.